Demian Maia should probably not be in the fight he has taken at UFC 211. His sterling run of performances should have been more than enough to earn him a title shot in the welterweight division by now and yet Maia gambles the streak of wins it took him three years to acquire against the talented Jorge Masvidal this weekend. Having watched Ronaldo 'Jacare' Souza go from jogging on spot atop the UFC's middleweight division to just a forty year old contender with no chance of getting a shot at the middleweight belt, it is quite clear that this could all go pear shaped for Demian Maia too. Consistency is hard to come by in combat sports, when matched against elite competition everyone loses eventually whether there is a shiny belt on the line or not. Where Demian Maia has had an impressive run of consistency, Jorge Masvidal seems to have overcome his hot-and-cold fights of the last few years to start a decent streak of his own. Masvidal has always been able to put on a tough fight against anyone you could care to name—his last loss that wasn't a split decision came in 2013—but he has dropped decisions based on his failure to push the advantage and occasional Bobby Greene like moments of 'that didn't hurt' defence with little to follow it up. A great all around fighter, Masvidal finally turned heads by stopping Donald Cerrone with strikes in January. Masvidal's takedown defence has always been something to admire. He maintained the third highest rate of success defending takedown attempts of any fighter in Strikeforce and he has done a great job against them through most of his UFC career. Masvidal's near 80% success rate against takedowns, combined with his dangerous striking is what makes him such a tough ask for Demian Maia who, while a great offensive takedown artist in his own right, is not a multidimensional threat on the feet. Masvidal's takedown defence has held up against wrestlers as tenacious and experienced as Benson Henderson and Rustam Khabilov. Against both, Masvidal was able to stuff shots, use the fence to hold himself up when necessary, and turn his opponent onto the fence when he desired to break away. Against both he was comfortable enough to pursue his own takedowns and succeed despite having none of the accolades of his opponents in grappling sports. Masvidal is also a fighter who makes excellent use of 'sneaker' strikes on the break. Each time he disengaged from Benson Henderson an elbow was shooting through from one angle or another in hopes of cutting Henderson open or knocking him out if he chased to maintain the clinch. Against the big middleweight Cezar Ferreira, Masvidal did an excellent job of breaking his hips off line and angling out to achieve the double collar tie along the fence. A short elbow wobbled Ferriera and a right hand put him to the mat for the finish. Masvidal's knees to the body from the clinch against Donald Cerrone were an effective deterrent too. Rustam Khabilov and Benson Henderson might both be takedown artists but are very different fighters to Maia stylistically. Rustam Khabilov fights with his back to the fence, going after his opponent's hips when they attack and then attempting to complete the takedown into space. Starting with his back almost to the fence, Khabilov makes sure that he is shooting into as much empty space as possible and that the opponent will not hit the fence prematurely and use it to hold himself up as he fights for grips. The fence is rarely a part of Khabilov's offensive gameplan. Khabilov's most successful moments of grappling came from grabbing a single and running Masvidal to the fence though. Khabilov was able to shuck his way to a back bodylock and threaten to take Masvidal's back. This is where the match up with Maia becomes an interesting one. 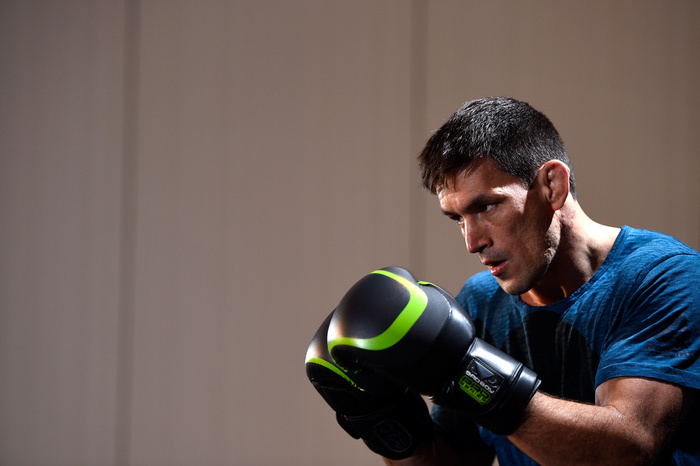 Demian Maia does not set up his shots terribly well. In fact you can probably count on one hand the number of times he has boxed into his takedowns. What Maia generally does well is time his takedowns as his opponent stepping towards him, or pressure the opponent to the point where if he ducks in for a leg he can be fairly certain that he can push them to the fence even if he cannot complete the single leg takedown. What saves Maia from being a one note grappler hopelessly failing on shot after shot is that he has options for initiating the grappling. Grabbing the single, hitting the fence and immediately finishing the takedown as he did against Condit is ideal, but he is just as happy to dive underneath his man and pull them on top of him. Something that Maia has demonstrated through his career is that opponents who defend his single leg attempts perfectly on the feet will have much more trouble if he first goes to his back, then comes up on the single leg simply based on the distance that exists when wrestling on the feet. So confident is Maia that he actually dragged Matt Brown into a quarter guard / three-quarter mount at one point and still came up on his single leg to sweep. Maia's best work during his recent run has often come against the fence. In competitive jiu jitsu and no gi grappling there are no barriers and so fence wrestling and wall walking have largely been an MMA exclusive exercise and can put the most accomplished pure grapplers and experienced mixed martial artists on level footing where they might not be out in the middle of the mat. In recent fights Demian Maia has used the expectation of the opponent making space and attempting to get up along the fence to take the back. Sequences like this one, where Maia allows Matt Brown to push away and scramble up from butterfly guard, are fairly commonplace in Maia's bouts. In fact, the third part of BJJ Scout's excellent study on Maia's passing gives a couple of examples in the opening seconds. Where the strategy of many strong cage wrestlers or takedown artists might be to force their method and hope to grind through the stalemates, the theme of Maia's recent career has been movement. Flowing with the go, as Rickson Gracie might put it. He doesn't generally hold on to an idea for dear life and will rock back and forth testing his options. It is when he is floating over his opponent's guard or tripoded over the opponent against the fence that he can create movement and then those years of experience and beautiful transitions can actually come into play. This focus on activity is probably for the best against Masvidal. Whenever Benson Henderson hung out on Masvidal's hips along the fence, he was fed an unpleasant diet of those not-quite-downward elbows to the side of his dome. One understated aspect of Maia's game is his use of strikes to improve position on the ground. While Maia battered Gunnar Nelson black and blue, more often his opponents don't look much worse for wear. However Carlos Condit has mentioned that the one strike Maia landed in their bout shook his head up—a nice right hand which Maia then established the cross face from in half guard—and Matt Brown had hand fought well with Maia for two and a half rounds when Maia cocked back his right hand and Brown reached for it before realizing that his neck was open. Eddie Bravo has often pointed out that Maia's basic reverse half guard pass—sliding his trapped knee through so that he is mounted with only the ankle trapped, sometimes called three-quarter mount—is considerably more useful in MMA than in grappling competition. In pure grappling the opponent will attempt to elbow escape or otherwise push the knee back to guard; in MMA the striking position is almost identical to the mount and any opponent who doesn't have their hands up by their head is going to get blasted. This fight seems like an obvious one on paper—it should come down to whether Masvidal can stop the takedowns and what he can do in between Maia's attempts. Masvidal's boxing has generally been pretty conservative and accurate and his jab is one of the most useful you will see in MMA. Against Donald Cerrone, Masvidal was straight shooting with his jab and used a raising of the lead leg interspersed with the occasional front kick to get himself into range and wedge his way down the middle of Cerrone's guard. We discussed this at length in Masvidal vs Cerrone: Controlling the Inside Line. The idea of Maia abandoning his almost purely grappling based gameplan for this fight seems a little far fetched but were he looking for chances to strike at Masvidal to open up the grappling a little more a couple of the latter's habits might be exploitable. Firstly Masvidal fights with rather a high guard for an MMA fighter. He is slick and hard to hit in the head—Gilbert Melendez edged out Masvidal in strikes landed by 118 to 100, but Melendez threw five hundred strikes over five rounds to land at just a twenty percent connection rate. Yet a couple of opponents including Benson Henderson and Rustam Khabilov have found some success slotting in body shots amid quick flurries. Level changing to jab or throw straights at the body has the bonus of looking similar to a level change for a takedown and can also hide sneaky overhands nicely. Use of the southpaw left straight to the body could open up some options for Maia on the feet—making his level changes a two part threat and possibly setting up shots to the head later on. Masvidal is one of the best examples in MMA of effective parrying, catching and countering kicks but Maia hasn't thrown them that often since that painful knockout loss to Nate Marquardt, so if Maia isn't shooting expect only a little boxing. Masvidal parrying Donald Cerrone's favourite left high kick. Jorge Masvidal can be a great technician to watch but can also give opponents too many opportunities to grab a hold of him and slow the fight down even if they cannot get him off his feet. In a fight perceived as 'striker versus grappler', time not spent out in the open hurts the striker. Against Khabilov, Masvidal kept jumping in with knee strikes and allowing Khabilov to tie up. His tendency to throw the right low kick without set up also allowed Jake Ellenberger and Khabilov to counter with big punches or pursue a takedown while Masvidal was on one leg. As Maia is a southpaw the angles won't be quite the same, and given Maia's love of the single leg takedown and desire to fight on the ground, Masvidal may well eschew low kicks altogether. If Masvidal can stop the takedowns it would be good to see him play the long game rather than looking for a quick knockout. Sticking to the jab and the occasional stiffer counter punch. Hitting the body with his hands when available and always being ready to deal with a lunging Maia reach for his lead leg. Maia is a fighter who works for the full fight but it is far less tiring for him to keep moving and advancing when he his on top of his opponent or on their back than when he is pursuing the takedown, When he fell short in the third round against Matt Brown his fatigue saw him clipped with Brown's only real strikes of the contest. It will be interesting to see how cage position and Masvidal's control over it plays out in this contest. Typically against a strong takedown artist a fighter wants to stay away from the fence to avoid being forced into a grappling engagement. But the fence can also be an ally in defending takedowns and returning to the feet once taken down. Much of Maia's best work in recent years has come against the fence, but will Masvidal be able to get off his back in the centre of the cage with nothing to build up against? Having considered it from a few different angles, it is hard to think of this fight as anything but a single round of “Masvidal stay on his feet?” and then the rest of the fight playing out the same. For Masvidal you would expect, short of Maia diving onto a hard counter in the early, the long fight should be preferred. Rory MacDonald had a tough time with Maia early in their bout but was able to keep returning to the feet and putting in body work which combined with Maia's furious pace to tire the Brazilian. It is interesting to reflect that most top flight fighters have had a hard loss or two where they were finished or completely outclassed but neither Masvidal nor Maia has suffered a one sided loss in years. The last time Maia looked uncompetitive was against Anderson Silva in 2010, and you will be hard pressed to recall the time that Masvidal was truly outclassed. They are two of the best in the game despite the losses on their records and on Saturday they are fighting for the chance, it seems, at a title shot. Both deserve their time in the limelight, it is just a shame that one has to lose.